This article confronts the claim that digital working methods have reduced architects’ skill in working with material. Those supporting the claim do not acknowledge the fact that modernism was precisely that which affixed the worldview of Heideggerian subjection of mute matter to human logic, and the neomaterialism predominant in today’s digital practice is, on the contrary, an understanding of material as an active component. It is digital design and the search for new form that brings the question of materiality ever more sharply into focus. The physical model and prototype are primary tools of the modern-day digital designer. However, the persistence of modernist production is the main obstacle to material experimentation infiltrating construction: abandoning tried-and-true technologies in favour of innovative and untested methods does not pay off. Most common building elements, such as the I-beam, are already included automatically in CAD-programmes’ toolbars and thus spur a deficit of choice. In order to construct stimulating architecture on a large scale, its design process must be optimised – designers need to progress quickly from idea to blueprints. Ideally, though, innovative solutions that enable a simple and economical building process could arise as a result of an intense and time-consuming design phase. This is indeed what distinguishes academic architecture from practice. In practice, the development of parametric tools has increased the possibilities for simulation and modelling of material qualities and restrictions in production. In a recent lecture at the University of Applied Arts Vienna, Christiano Ceccato (a specialist in computational rule-based design systems and parametric form finding) of Zaha Hadid Architects introduced solutions that the office has created. Among architects, BIM (Building Information Modeling) has become a swear word to some extent, tinged by standardisation and regulation. Ceccato prefers to use the terms ‘parametric’ or ‘automated working method’, which may perhaps leave the impression of greater freedom – it is possible for the architects to determine more on their own. The secrets of Zaha Hadid Architects’ success are complicated adaptive systems, which take the production factory’s possibilities as input parameters. One of the most colourful examples of material inclusion that he gave was the Galaxy Soho aluminium-facade saga, over the course of which the architects visited most of China’s aluminium producers in search of a suitable facility. The facade’s ultimate appearance was the result of the standard size of aluminium-sheet rolls, the work-space of CNC benches, and the particular attributes of the aluminium’s flexibility. No matter how much architects may want to familiarise with the nature of a material and come up with new ways to use it, in a practice that yearns for immediate yield, building models must still mainly adhere to the opportunities provided by production lines. While interning at the Gehry Technologies office several years ago, I worked on optimising a building’s glass facades. The project foresaw massive free-form glass surfaces that had to be made producible. In order for this to happen, an optimisation tool was developed in Paris for a Belgian facade-maker according to the parameters supplied by an Italian glass supplier. Taking into account the parameters of a CNC bending furnace that was to be used for shaping cylindrical and conical glass panels with a certain maximum size, we created a virtual smart-panel that could adapt the most exact producible shape according to the given design surface. This kind of post-rationalisation process takes materials’ qualities directly into account, but is nevertheless a compromise – ultimately, the producer’s machines dictate the types of elements into which the designed surface will be divided. In Ceccato’s opinion, designers could be involved more in pre-rationalisation, i.e. already taking into account the limitations derived from the materials and production in the initial design phase. Ideally, however, entirely new methods of production could be created, and only the possibilities that stem from the material’s qualities would be taken into account. Or, if a material that possesses the necessary qualities is lacking, why not invent a new one? The pioneers of digital design knew from the very beginning that the execution of new forms in today’s pace of life and while remaining true to new tools requires the implementation of new technology in construction. The three-axis CNC milling machine was the first ‘new’ (dating back to the mid-20th century) technology used to start creating new forms. For a designer working on CAD programmes, operating a milling machine is not especially difficult either. This type of immediate CAD-CAM connection has placed the designer into the role of craftsman once again. Just as every tool, the machine leaves its own mark on the material, which can be used to achieve various kinds of surface finishes. Designing the tooling path is just as important as the form itself, in addition to a connection with the material, of course: the feasibility or suitability of various millable forms with the structure of the wood or some laminated material. The implementation of CNC milling enabled almost immediate feedback between the digital and the material. Computer-controlled milling is not that different from hewing a marble pillar, but it enables one to evaluate the form before completion and to then make identical copies. By performing these endless experiments, one’s understanding of the material’s behaviour, tolerances, and aesthetics also grows. As dealing with new production methods is risky in practice, knowledge and experience must come from somewhere else. This ‘somewhere’ can only be the academic environment and creative activity. Hadid’s architects with scripting skills come, for the most part, from among Hadid and Schumacher’s own students. Capitalist building projects do not especially favour a creative approach. Therefore, material cognition must come precisely from one’s studies (or teaching). By now, every architecture school that is on financially good footing and is interested in materiality possesses 3D milling machines, laser cutters, 3D printers, and industrial robots. These tools have brought an abundance of new materials (plastics, composite materials, even natural silk) to the architect’s desk, materials which have been impossible to work with in the creative process on such a level before. The precision with which prototypes can be built gives architects a much better idea of how the final component, product, or building will behave. Newer 3D printers enable the combination of different materials. Composite objects created under the direction of Neri Oxman at the MIT Media Lab take advantage of the possibility to vary the colour, stiffness, or transparency of a material. Printing is an unprecedentedly flexible technology, which enables each and every particle to be positioned in the exact point in space, where it is needed. It is possible to create forms with never-before-seen complexity while expending just as little effort as one would with a simple cube. Whereas in construction the main focus is upon the physical qualities of materials, academic reasearch has to offer open-ended experiments, in order to discover and assess the tactile and aesthetic qualities of materials. In 2011, I had the opportunity to take part in Peter Testa’s Real-Time-Robotics course at the brand new SCI-Arc Robot House, where our task was to become familiar with the tool instead of designing. Robots enable a connection between the virtual reality of a CAD programme and real space; however, the connecting link is not the translation of form from the digital to the physical, but rather motion, choreography, and process. The precision and control that robotics enables allows us to work with material in unprecedented ways. Technology that only experts with generations’ worth of experience have been able to master previously can now be translated into a row of code and repeated ad nauseam. In the sPhysical project, we attempted to utilise the characteristic precision and repeatability of the movements of a robot arms in creating through hard-to-control material processes (such as melting or expanding). There are simple ways for translating motion in the CAD world, but we were interested in what would work similarly computationally and in real space. 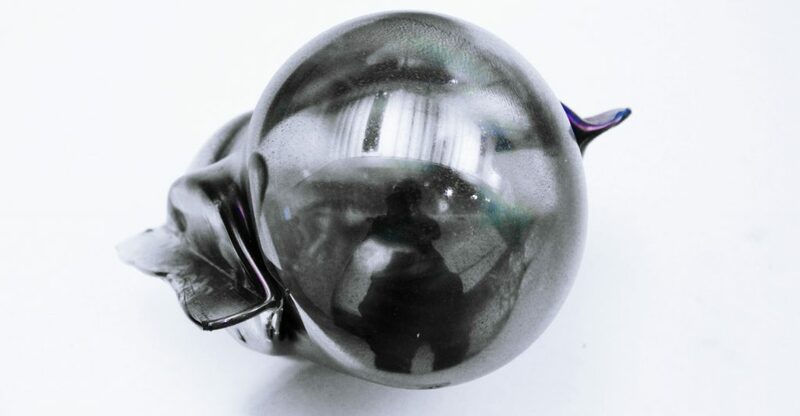 In order to demonstrate that kind of thought process, we translated the location and the speed of a virtual tool into a deformation expanding the object that whas being shaped, which we transferred into material with the help of a heat gun and pressurised plastic blanks – a simplified version of glassblowing. This very primitive and clumsy experiment produced beautiful aesthetic results, but also enabled us to form conclusions about what could be created using such technology in the future. It is an exceptionally effective production process, in which one does not need to make a formwork or mould for creating a free-form, and no waste is produced. It is impossible to create that kind of production method without knowing the qualities of the matter and without performing thousands of experiments, over the course of which the tactile, formal, and atmospheric qualities of the material also become clear. There is a long way to go from academic experimentation to useable construction, but, sooner or later, innovative efforts will also move from theory into practice. Currently, production has been so optimised, calculated, and forecasted that any kind of update to it seem like a leap into the unknown and will more likely than not be an economic failure. However the transformation will start from the other end. CNC machines are slowly moving to the status of kitchen appliance. Even now, it is possible to acquire a consumer-class 3D printer and models downloadable from the internet to be churned out without any special knowledge. The minimalist user-interfaces enable one to tweak parametric models, which turn into reality with the push of a button. It is far more difficult and time-consuming to crochet a doily than it is to create a unique structure with a couple of commands and to print it out. Those who wear glasses know how difficult it is to find a suitably shaped pair. Even if the person knows exactly what kind he or she likes, the shape, colour, or various details of the glasses might not suit the shape of his or her face. At the same time, instead of defining a specific shape, it is possible to write down the proportions a frame-style should have in relation to the spacing of the individual’s eyes or the height of their forehead. Such a system does not in any way reduce the designer’s authorship – creating generic objects has become natural in the era of rapid prototyping (or rapid production, rather). Hand-craftsmanship will always remain the most enjoyable method of creation, but few can allow themselves such a luxury. The printing of personalised products is not, however, any more costly than the production of identical copies. If we speak about the loss of tactility in architecture, then this has more to do with the present societal situation than it does a critique of architects’ tools. CAD and BIM programmes are certainly not to blame for soulless glass colossuses being built, just as CNC machines have not robbed designers of their material cognition. Every beginning is hard – digital production is still in its infancy. However, signs that the more high-flying ideas being developed in universities are finally reaching construction can already be seen. If it is not possible to extend the cost-effective building period for structures, then we should be making sure that the creative process comprises as long a part of that short period as possible. In this way, more attention could be paid to cognitive qualities in constructed projects. This can no longer be done by hand. Marjan Colletti, “Openness and FrAgility of (Post)Digital Design-Research” in Interspace. Essays on the Digital and the Public, ed. Johanna Jõekalda, Johan Tali and Siim Tuksam (Tallinn: Estonian Centre of Architecture and Lugemik, 2014) p 203.